Samson Tsegaye is working as leader for different organizations. 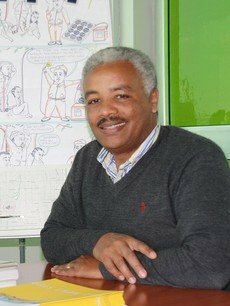 He holds diplomas in military engineering & administration (Holeta Genet Military Academy), project management in renewable energy industry (Renewables Academy AG, Berlin) and business management & entrepreneurship (Alison Academy) and a certificate in electricity at Addis Ababa Technical School. Tsegaye is the Country Director of Solar Energy Foundation since 2006. The foundation established the first solar village in Ethiopia and installed over 30,000 solar lighting systems for rural parts of the country.